If you're looking for places to stay near Elephant Rocks, Plain & Fancy B&B would love to have you. Just minutes from the park, you'll enjoy our luxurious accommodations at our farm getaway in the country. Enjoy relaxing in our swimming pool, go horseback riding and luxuriate in our gardens and hot tub under the stars. Visitors to Elephant Rocks State Park can easily view the granite boulders from the one-mile Braille Trail, designed to accommodate people with visual or physical disabilities. The trail passes by a quarry pond, which now supports a variety of animal life. A short spur off of the trail takes visitors to the top of the granite outcrop, where they can explore the maze of giant elephant rocks. This red granite, first commercially quarried in the late 1800s, has been used as building material and as paving blocks for the St. Louis levee and downtown streets." 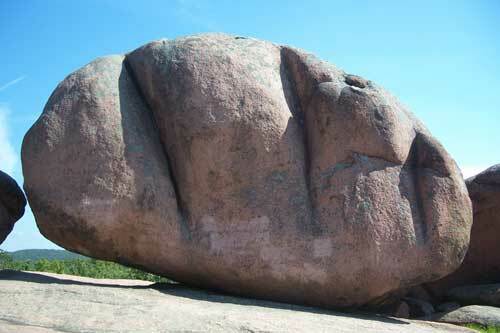 Find out more about Elephant Rocks and the fascinating geology of the park. 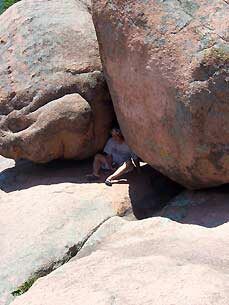 Click to learn much more about Elephant Rocks.